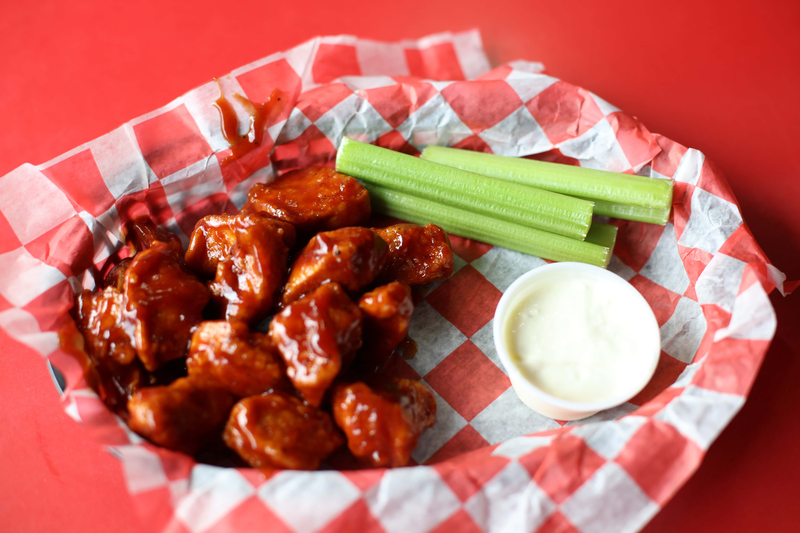 Try our wings (pick one way per order): - Lightly tossed in any Legend Larry award-winning sauce or our house sauces - Plain - Paulie's "Original" breaded Sauces (Rated Hot to Mild) D.O.A. Heaven & Hell Scarry Larry Hot Hot Garlic Medium Yelllow Jacket Forbidden Fruit Spicy Bacon BBQ Spicy BBQ Mild Sweet Heat BBQ Honey BBQ Sweet Baby Rays BBQ Teriyaki Drunkin' Cherry Twisted Parmesan Garlic Served with your choice of a side of any sauce, or ranch or blue cheese dressing and a side of celery. 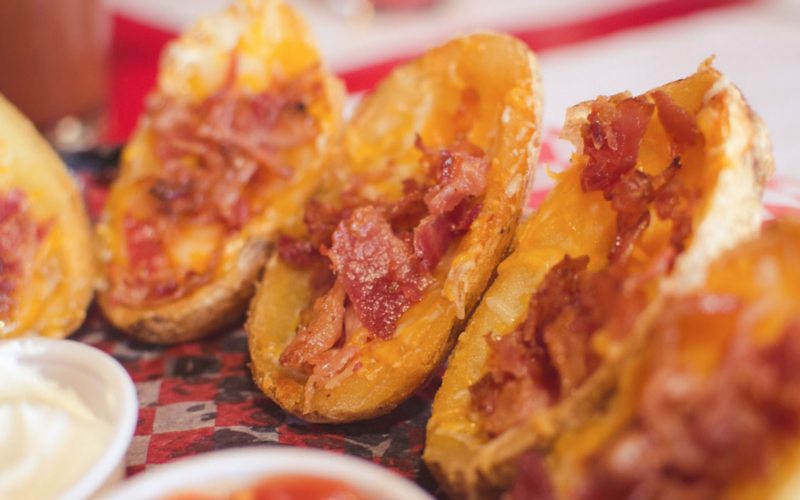 Six deep fried skins, filled with shredded cheddar cheese, topped with bacon and warmed to a golden brown. Served with salsa and sour cream. 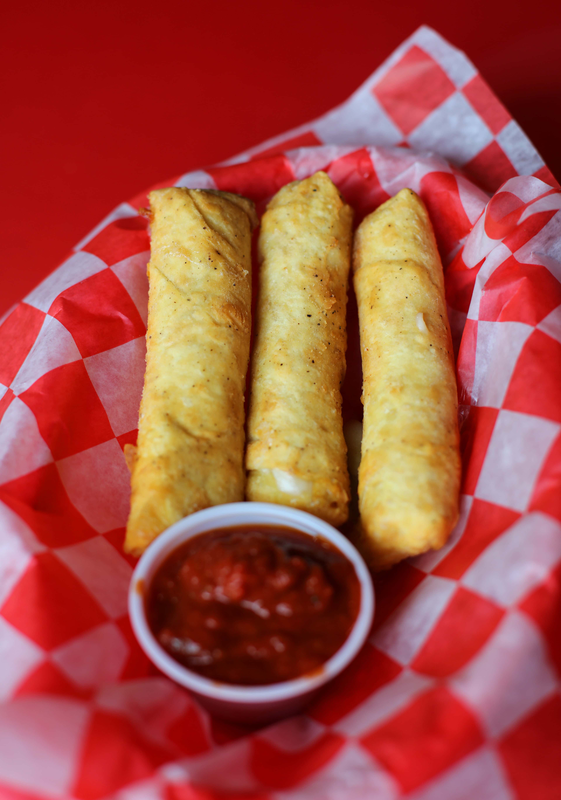 Three jumbo wonton rolled mozzarella sticks that will satisfy anyone’s cheesy cravings. Served with marinara or ranch dressing. 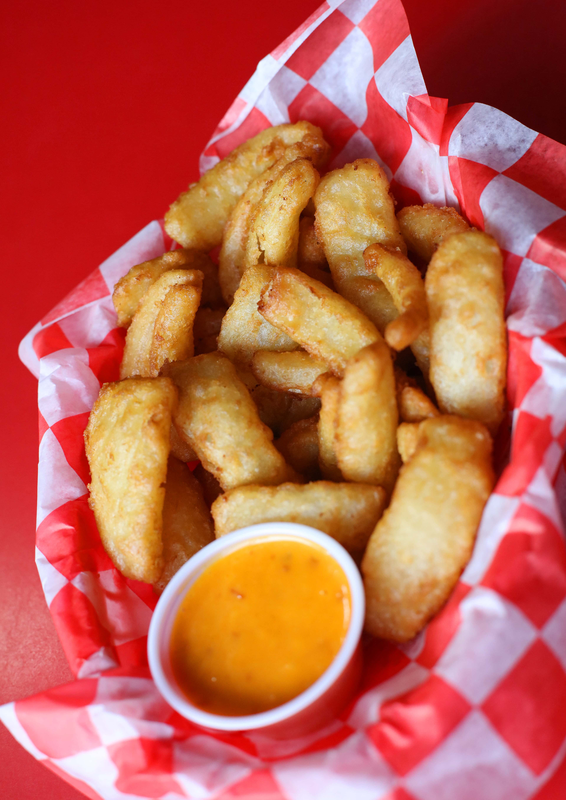 Served with our special boom-boom sauce, it's a zesty mayo based sauce with a kick, great for dipping. 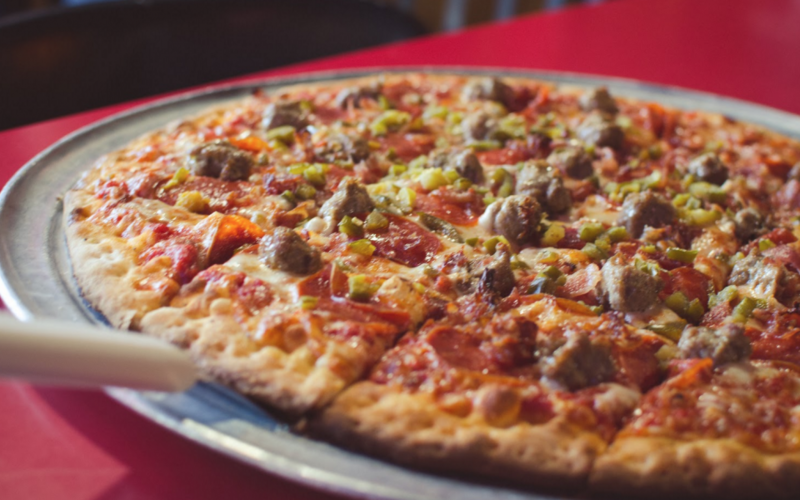 A great side to our homemade pizza. Light breaded white cheddar cheese. A Wisconsin tradition. 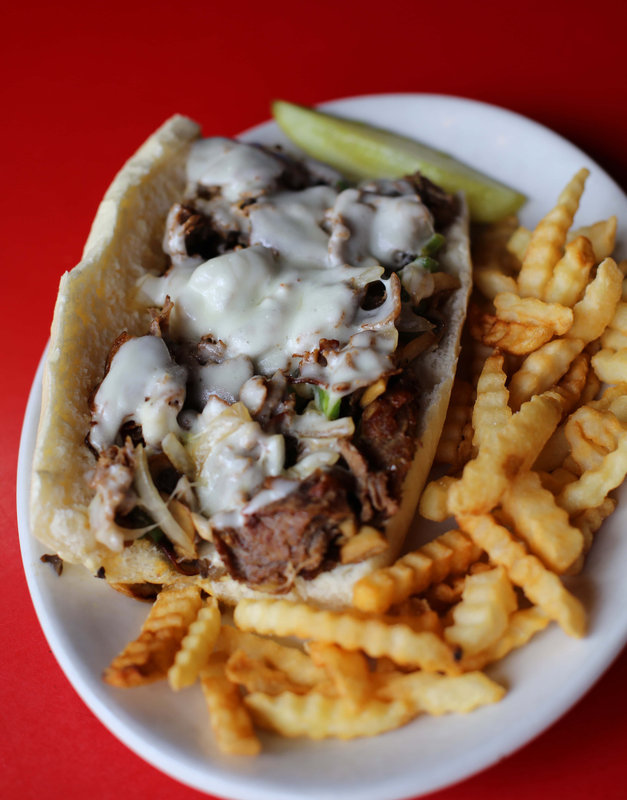 Serviced with Marinara sauce or ranch dressing. 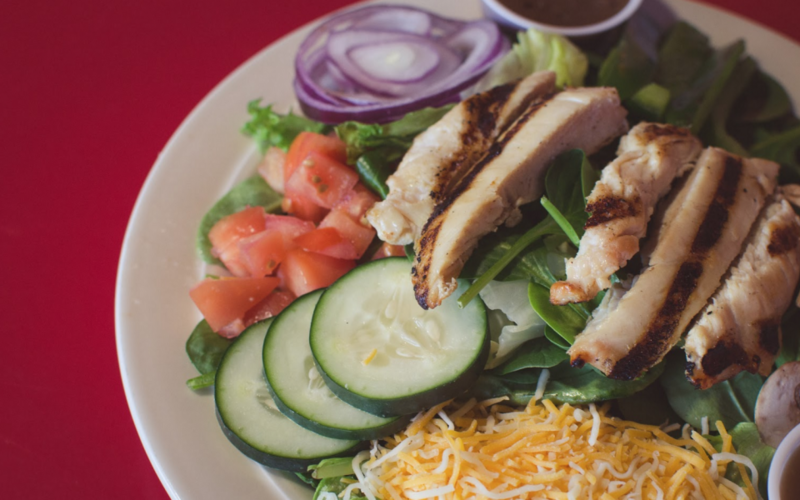 Our house blend of romaine and iceberg lettuce, grilled all-white diced chicken, shredded cheddar cheese, tomatoes, mushrooms, green peppers, red onions, cucumbers and toasted croutons. Served with your choice of dressing. 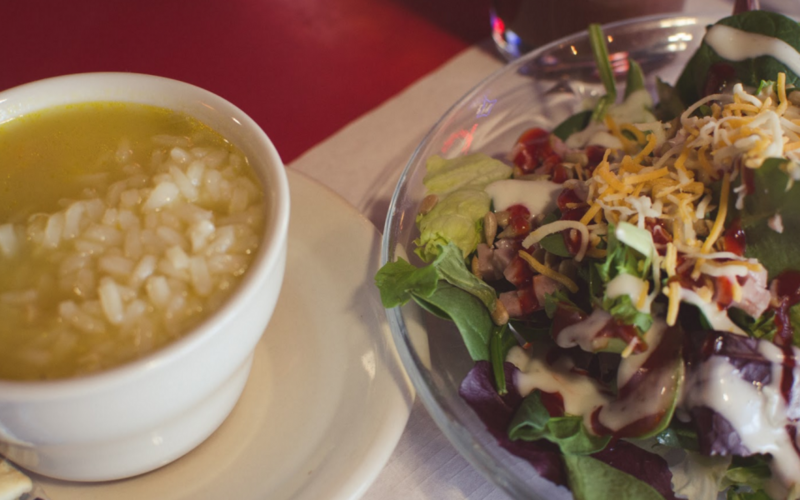 Ask your server about our soup of the day, so we won't have to say, "No soup for you!" Served with crackers. Our house blend of romaine and iceberg lettuce topped with tomatoes, mushrooms, green peppers, cucumbers and toasted croutons. Served with your choice of dressing. 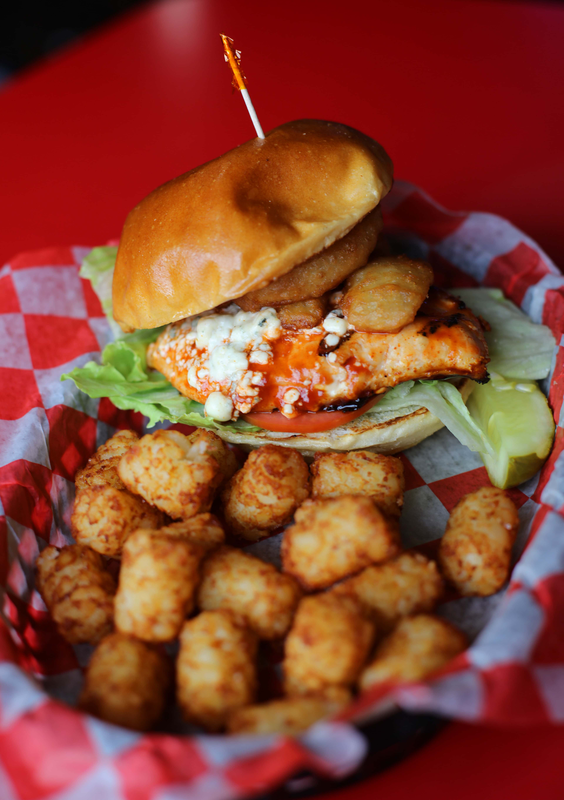 Grilled all-white diced chicken tossed in your choice of wing sauce with bleu cheese crumbles and crispy onion petals served on top a bed of our house blend of romaine and iceberg lettuce. 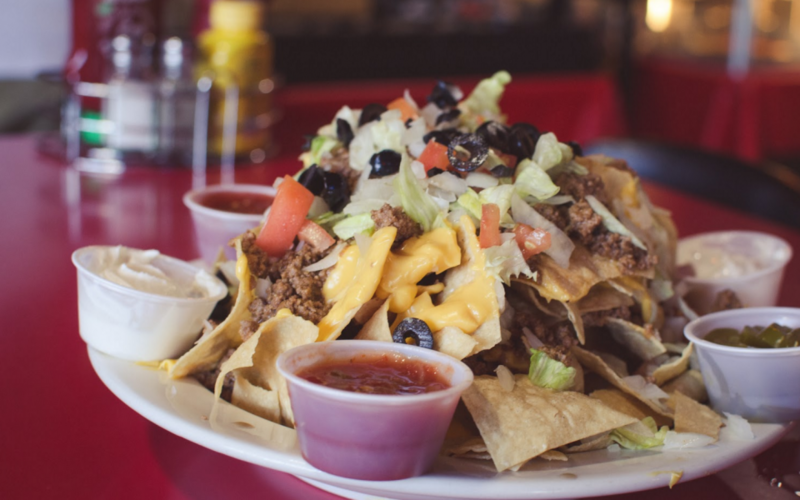 Served with your choice of ranch or bleu cheese dressing. 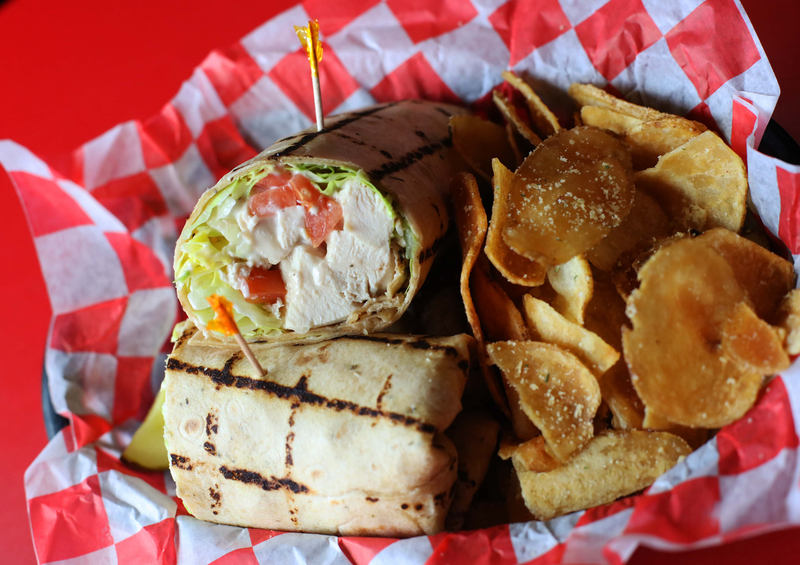 Wraps All wraps served with French Fries or our House Parmesan Ranch Chips and a pickle spear. Grilled all-white diced chicken rolled in your choice of hot sauce, shredded iceberg lettuce, tomatoes and chunky bleu cheese dressing in a warm tomato basil wrap. 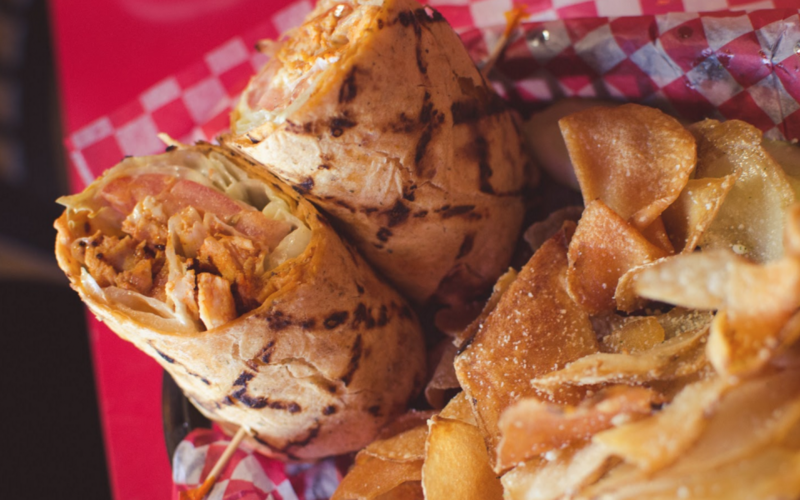 A warm tomato basil wrap rolled with crispy bacon, tomato slices, shredded iceberg lettuce and mayo. Prefer on white toast, just ask! Grilled all-white diced chicken, tomatoes, shredded iceberg lettuce and ranch dressing nestled in a warm tomato basil wrap. 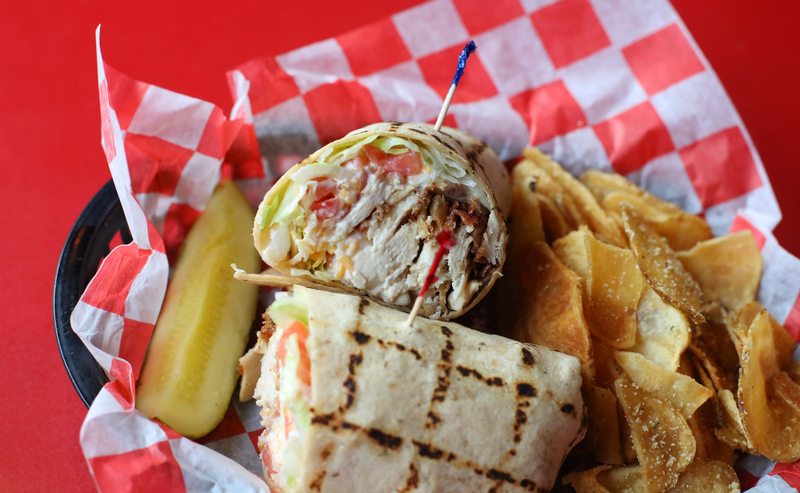 Grilled all-white diced chicken, bacon, tomato, shredded cheddar cheese, red onion and shredded iceberg lettuce with your choice of bleu cheese or ranch dressing rolled into a warmed tomato basil wrap. Grilled all-white diced chicken, shredded iceberg lettuce and tomatoes and our special Boom-Boom sauce, a zesty mayo based sauce with a kick, all rolled into a warm tomato basil wrap. A 7 oz. 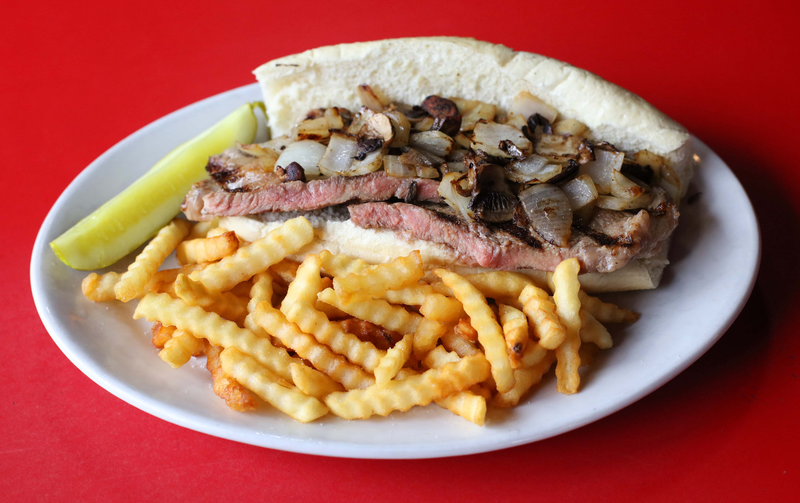 prime ribeye grilled to your liking and placed on a lightly toasted hoagie bun with fried mushrooms and onions. Served with French fries and a pickle spear. 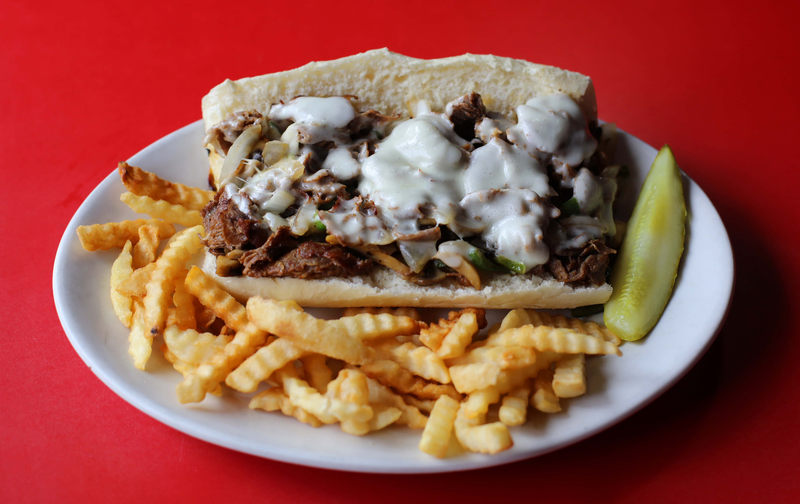 Thinly chopped ribeye topped with provolone cheese, topped with sauteed onions, green peppers and mushrooms all placed on a lightly toasted hoagie bun. 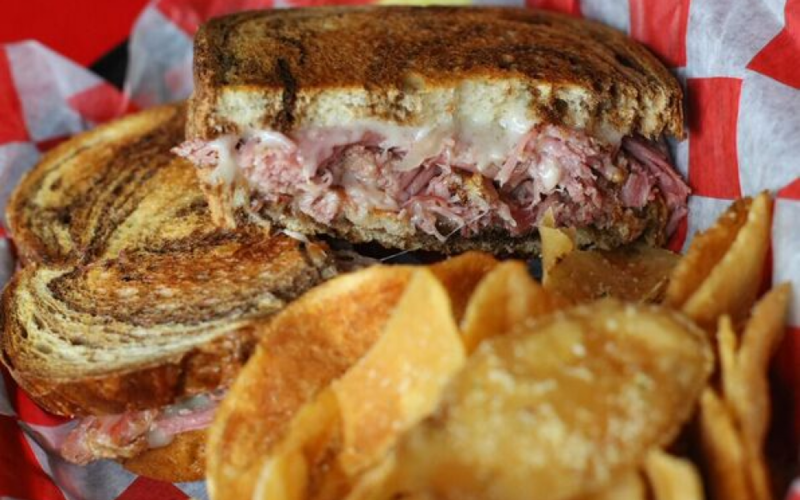 Mouthwatering slowcooked corned beef brisket, sauerkraut, Swiss cheese and Thousand island dressing grilled to perfection on marble rye bread. Horseradish on side upon request. 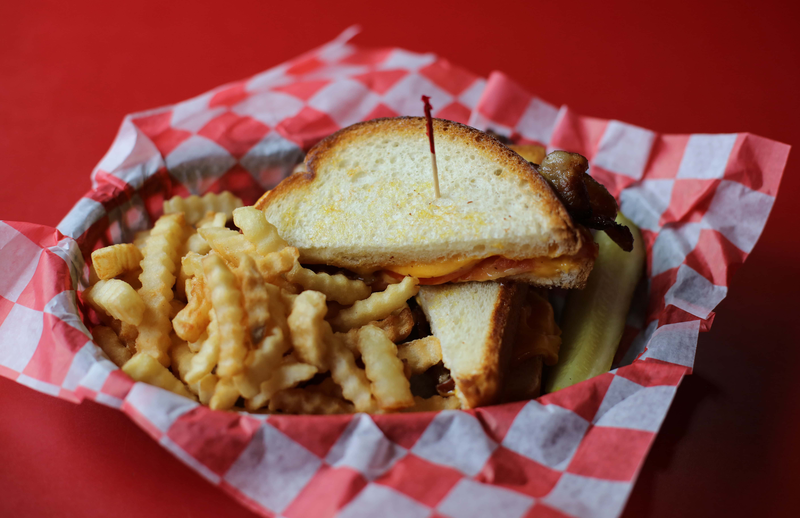 Grilled cheese sandwich with American cheese, crispy bacon, and tomato. Served grilled on white bread and served with fries. Yum! A grilled all white meat chicken breast topped with cheddar cheese, Sweet Baby Ray's BBQ sauce and two crisp slices of bacon served on a lightly toasted butter top bun. A grilled chicken breast dusted with Cajun seasoning. Served with shredded lettuce and tomato on a lightly toasted butter top bun. Mayo upon request. 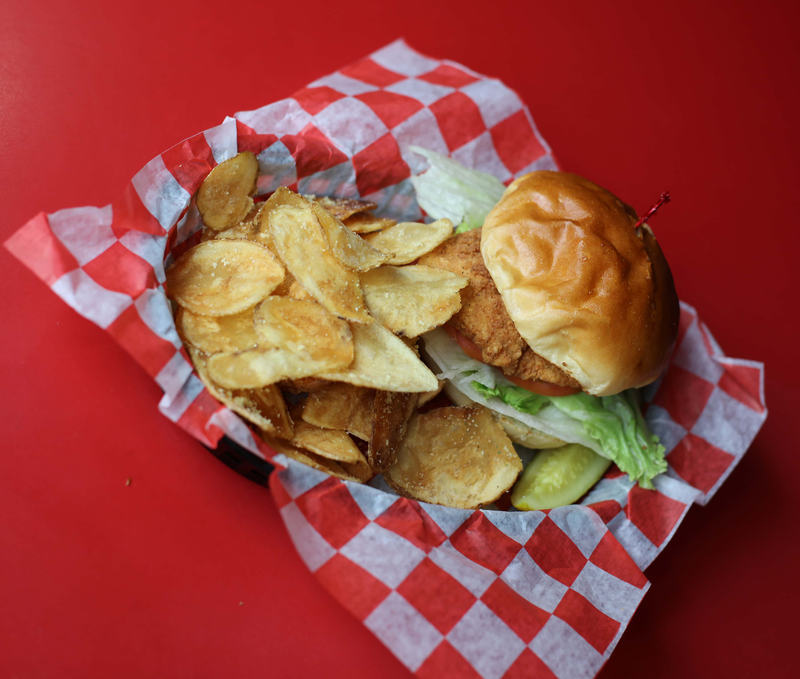 A lightly seasoned grilled or panko breaded chicken breast served with shredded lettuce and tomato on a lightly toasted butter top bun. Mayo upon request. 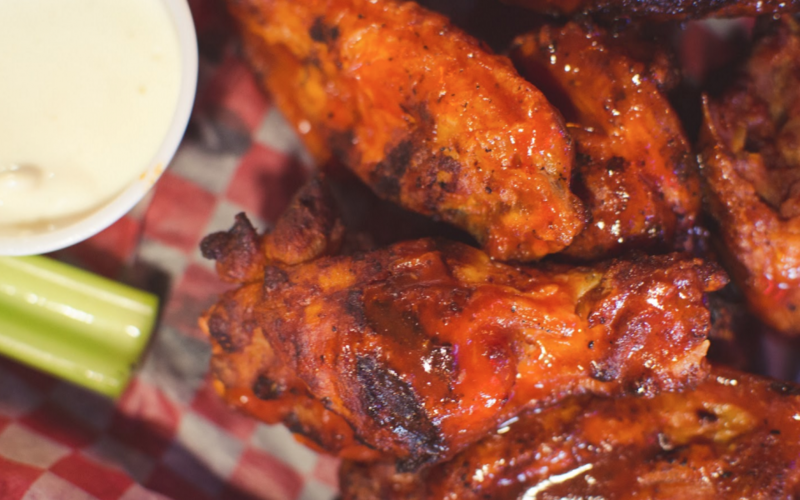 A grilled all-white meat chicken breast with your choice of wing sauce, topped with blue cheese crumbles, shredded lettuce, tomatoes slices and topped with onion petals. All on a lightly toasted butter top bun. Our 1/3 lb. 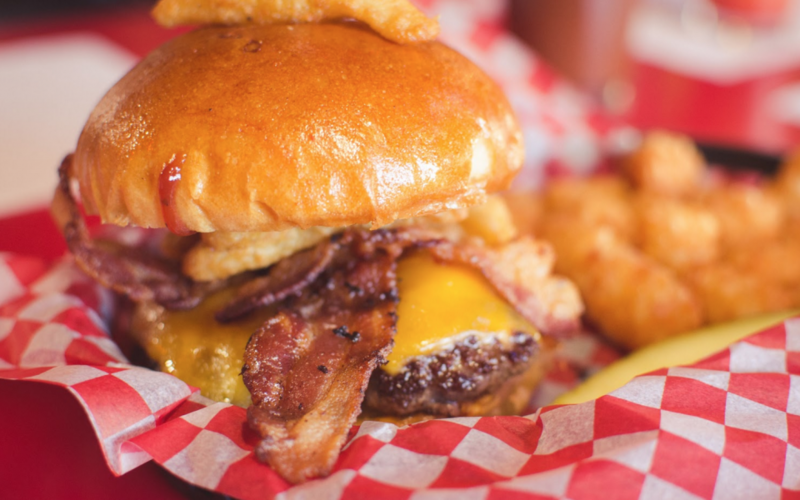 burger topped with Sweet Baby Ray’s BBQ sauce, cheddar cheese, crispy bacon and onion petals. Served on a lightly toasted butter top bun. 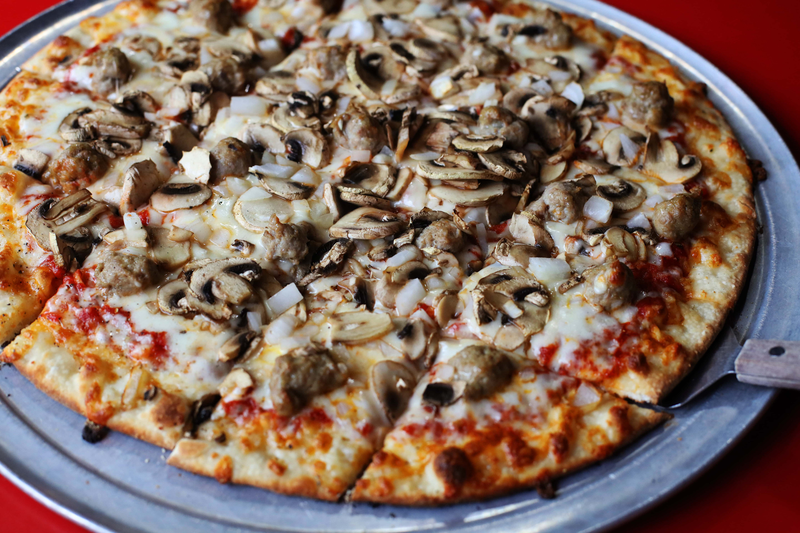 Covered with Swiss cheese and topped with sautéed mushrooms. Served on a lightly toasted butter top bun. Try it with our mushroom gravy on the side, just ask. 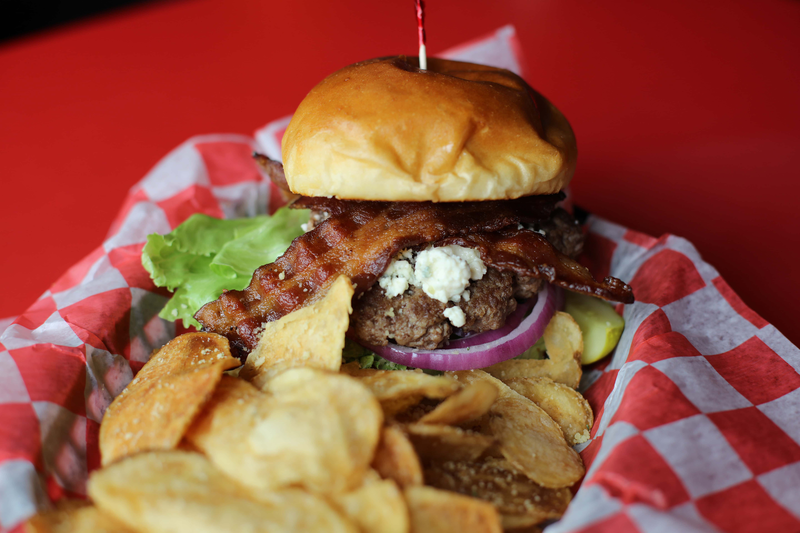 Our 1/3 lb burger covered with blue cheese crumbs, crispy bacon, shredded lettuce, and sliced red onion. Served on a lightly toasted butter top bun. 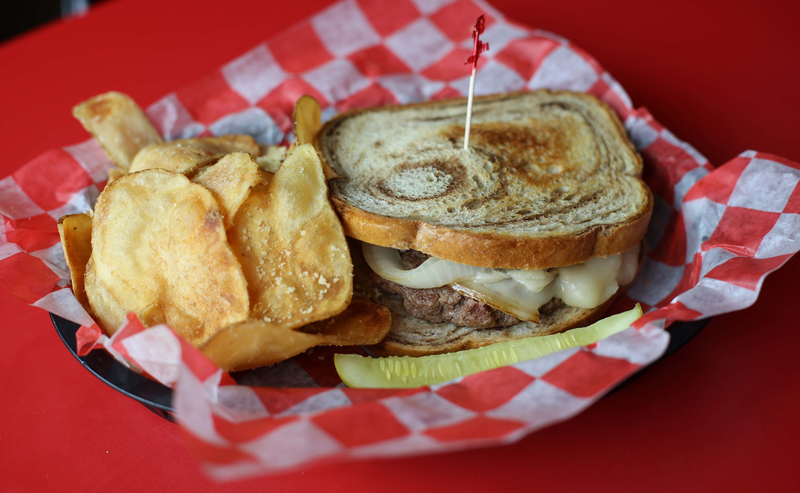 Our burger covered with your choice of American or Swiss cheese and sautéed onions on lightly grilled marble rye bread. A 1/3 lb. 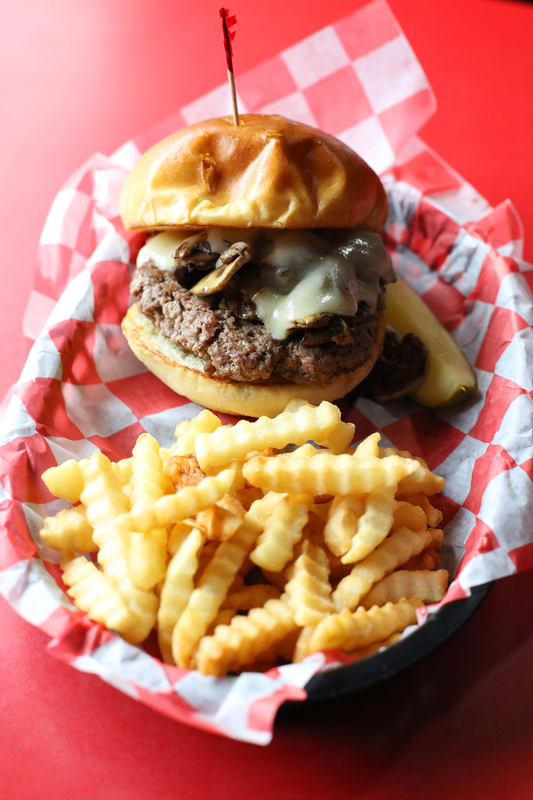 angus beef burger topped with American or your choice of cheese. Served on a lightly toasted butter top bun. Double the pleasure, two 1/3 lb. grilled burgers with your choice of cheese. Sausage, mushroom, onions and cheese. 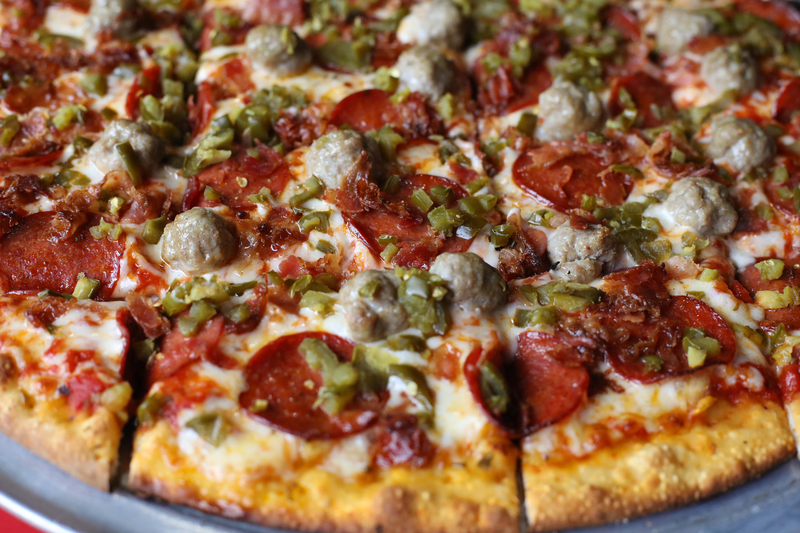 Pepperoni, sausage, bacon, jalapenos and cheese. All-white diced chicken breast, red onions, Sweet Baby Ray’s BBQ sauce, and topped with cheddar and mozzarella cheese. Salsa, taco meat, shredded cheddar, tomatoes, black olives and lettuce. Garlic butter and a mozzarella-provolone cheese blend with a side of ranch or marinara. Sausage, Pepperoni, Canadian Bacon, Hamburger, Canned Mushrooms, Fresh Mushrooms, White Onion, Red Onion, Green Peppers, Black Olives, Green Olives, Artichokes, Pineapple, Jalapeños, Extra Sauce, Extra Cheese, Extra Meat. 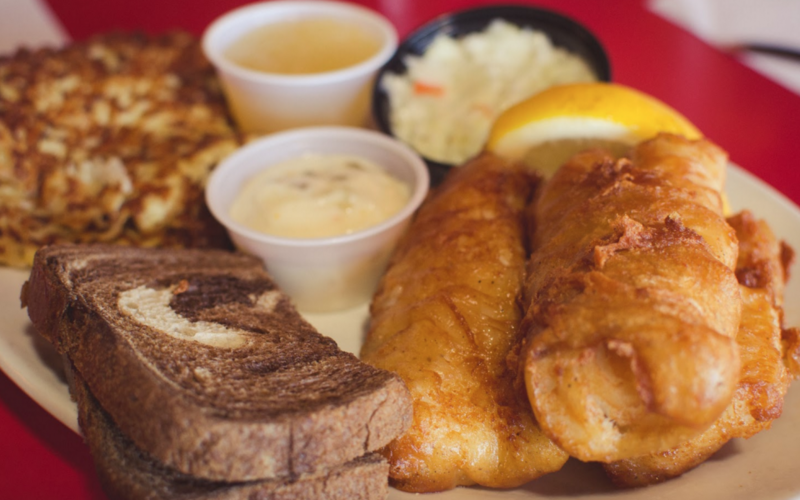 Friday Fish Fry Served with your choice of Buttered Red Potatoes, French Fries, House Parmesan Ranch Chips or Potato Pancakes (with applesauce or syrup), along with creamy cole slaw, marble rye bread, fresh lemon wedges and tartar sauce. 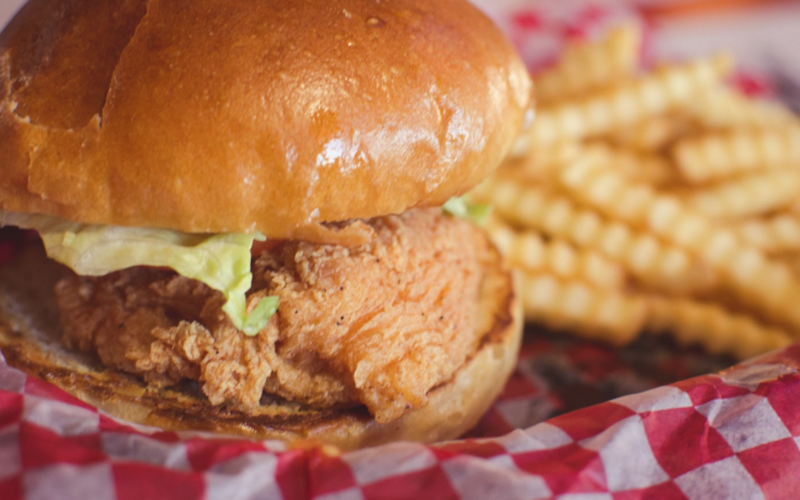 We hand our and fry every order. Please allow us time to work our magic! 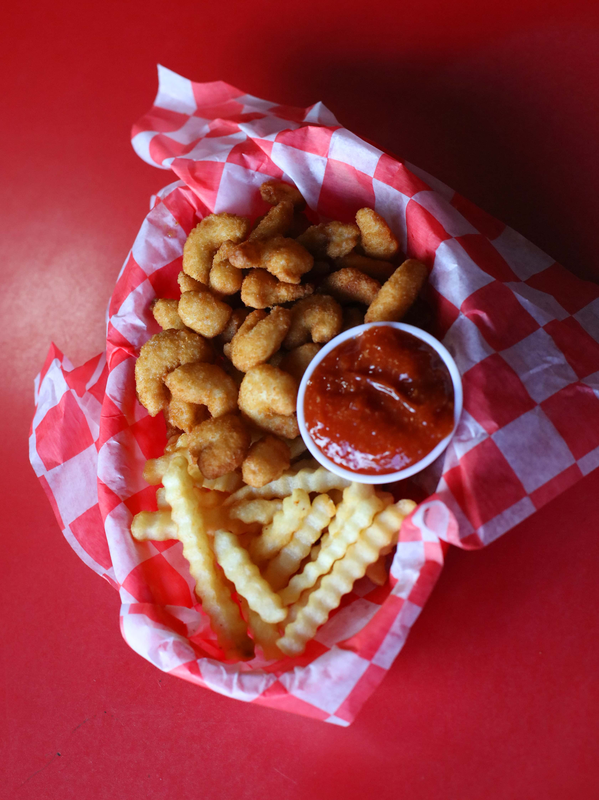 A 1/2 pound of breaded popcorn shrimp. Served with cocktail sauce and fries. Three pieces of cod loins, lightly oured with Paulie's special seasoning and deep fried to a light golden brown. This takes a bit longer but it is worth the wait! Three pieces of baked cod, you choose the way you like it... lightly buttered and seasoned with your choice of lemon pepper & paprika, Cajun or Paulie’s secret zesty blend all served with a side of drawn butter or tartar sauce. Three pieces of cod loins, battered using our seasonal lager. Two pieces of our lightly breaded cod served with shredded lettuce, tomatoes slices and American cheese served on a lightly toasted Hoagie bun with a side of our tasty remoulade sauce. Served with choice of potato and coleslaw. 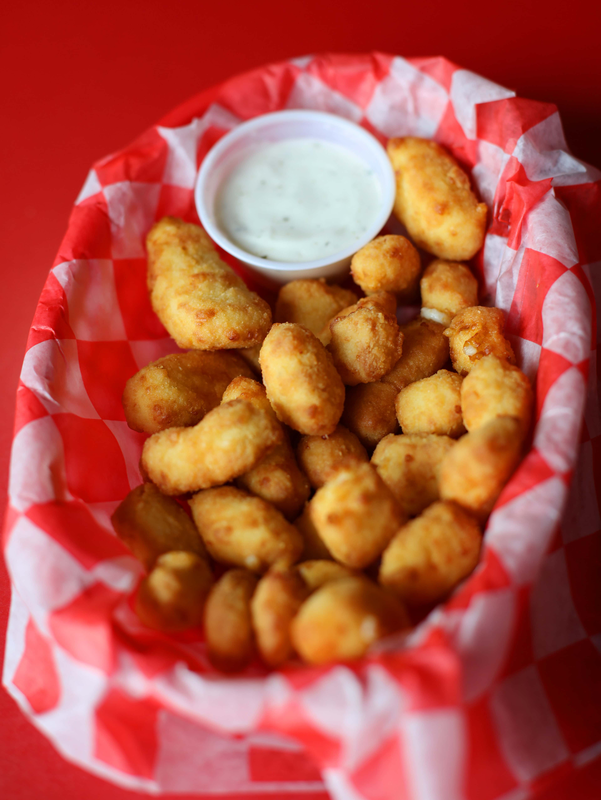 If you love lake perch, you’ll nd our 3/4 lb. of lightly oured and deep fried perch outstanding!